Learn how to care for your wooden fence. 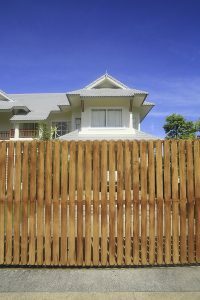 Wooden fences are a beautiful and long-lasting way to add security and privacy to your home. However, wood fences do require maintenance that some other materials do not. Most of the maintenance for a long lasting fence is quick and easy to complete. Frequent visual inspections to ensure that none of the pickets are rotting or excessively dirty is key to increasing your fence’s lifespan. Loose, missing, or overly rusty nails should be hammered back in place or replaced as necessary. Additionally, keep a visual check that the fence isn’t leaning or buckling. After storms and inclement weather, you should always do a quick check of your fences perimeter to ensure that there is no damage due to rain or wind. If some sections do need repairs, it’s best to do it as soon as possible to prevent further damage. Unlike metal or vinyl, wood is subject to mildew and rot. Fortunately, both of these problems can be prevented with basic cleaning. Mildew cleaner or simple soap and water should be used with a scrub brush to clean the entirety of the fence. Keep an eye out for any signs of rot, and ensure that you are not causing any standing water around exposed wood. Every few years your wooden fence will need a coat of paint or stain. Not only will this keep your fence looking its best, but it will help protect the wood from weather and prevent dirt buildup. If you like the look of the natural wood you can use a water sealant instead; this step is essential if you choose to skip the paint and stain. Lastly, every year, you should re-caulk the area where the wooden posts meet the cement fence posts. By ensuring that the seal here is secure, your fence posts won’t suffer from rot damage and the lifespan will be increased dramatically. This entry was posted on Friday, September 7th, 2018 at 12:31 pm. Both comments and pings are currently closed.